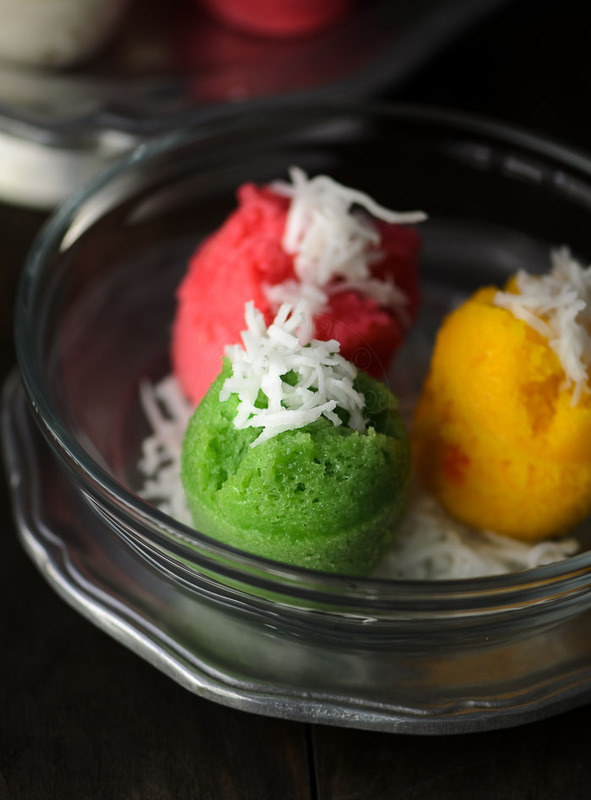 Gluten-Free Steamed Rice Cupcakes or best known as Apam Beras is one of my favourites! My auntie (my dad's sister) made awesome steamed rice cupcakes... soft, fluffy... just beautiful. Mom might have tried making her own few times... She might have given up, as hers didn't rise as much. It was easier to get her sister-in-law to make us these little bites :). 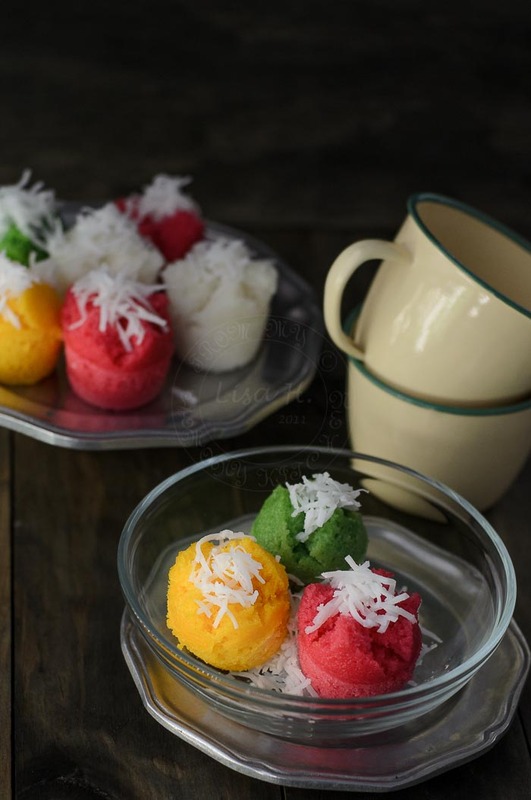 I was one happy kid to wake up to see beautiful, colourful little steamed rice cupcakes under food cover with a bowl of slightly salted freshly grated coconut next to it. Growing up in predominantly Malay kampong (village) in Kedah, I was quite sheltered and thought that... these rice cupcakes are common sight to my family and I and people around me, until I married my husband. Then I knew that Chinese too has their version of steamed rice cakes that they use for their prayers... and they do not eat these rice cakes with grated COCONUT ;P.
These cupcakes are gluten free, fat free ...my advice, if you want to try it out... plan it well :D.
You will require at least 3 1/2 days (2 days for rice fermentation stage; 1 day for the batter to rest) before you could bite into this gorgeous colourful soft gluten-free steamed Rice cupcakes :). Cover and set aside in cool place for 2 days. By the 2nd night, fermentation in progress by the sour-ish aroma. Transfer fermented rice, sugar into a blender with 1 cup of water. Set aside for 4 hours or overnight. Serve with grated coconut with a pinch of salt added. They are beautiful! What is eno? Eno is a fast-acting effervescent fruit salts. You may be able to find alternative in Germany. These are the bomb!! I love that they are easy to make and the kids love them as well! Can’t beat that! I've never heard of these before but they look yummy and fun!! I'll have to try these out and I'm gluten free to yeah!! These are so beautiful. The colors are so vibrant! This is such a unique recipe to me! Never seen anything like it! Sweet delicacy from Malaysia/ South east Asia region. 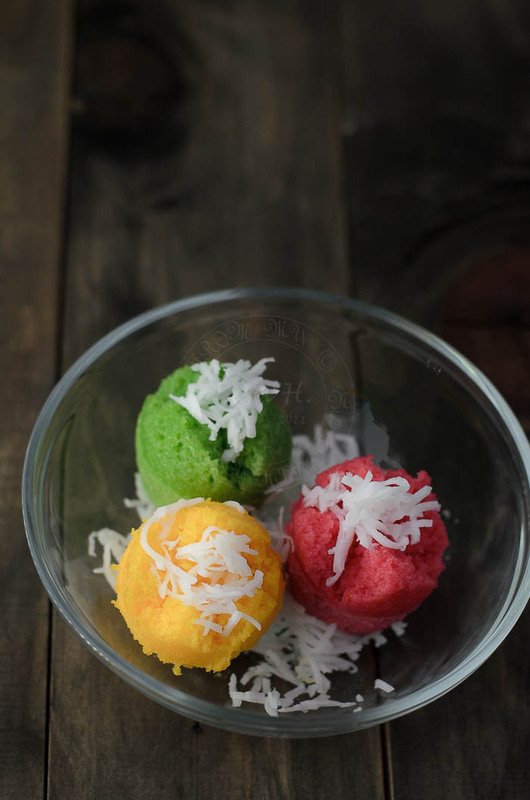 Such colourful apam ! We often seen these selling at market places and route side food stall here. These look delicious! Can the Eno be replaced with gluten-free baking powder?